Whistleblowers perform an important service by reporting what they reasonably believe to be evidence of wrongdoing, and should not be subject to, or threatened with, reprisal for doing so. The Whistleblower Protection Enhancement Act of 2012 strengthened protection for Federal employee who blow the whistle on waste, fraud, and abuse in government operations. The Treasury Inspector General for Tax Administration (TIGTA) designated a Whistleblower Protection Ombudsman in accordance with this Act; however, the Whistleblower Protection Coordination Act changed the title toWhistleblower Protection Coordinator. Coordinating with the U.S. Office of Special Counsel, and other agencies, and non-governmental organizations on relevant matters. NOTE: TIGTA’s Whistleblower Protection Coordinator cannot act as a legal representative, agent, or advocate for any individual whistleblower. Reports concerning wrongdoing by TIGTA employees or in TIGTA programs should be reported directly to TIGTA’s Hotline or at 1-800-366-4484. 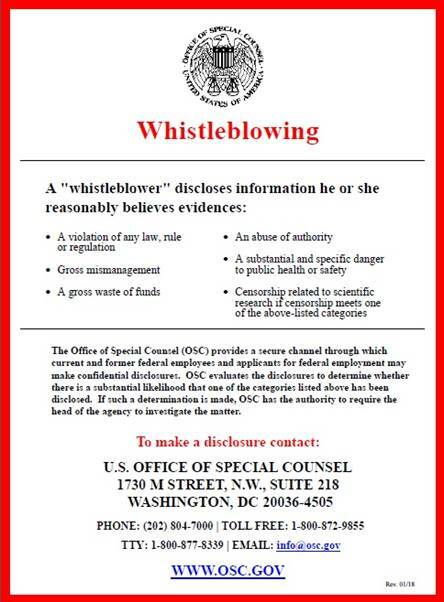 For more information on whistleblower rights and protections, please see the pamphlet prepared by the Office of Special Counsel, Know Your Rights When Reporting Wrongs. 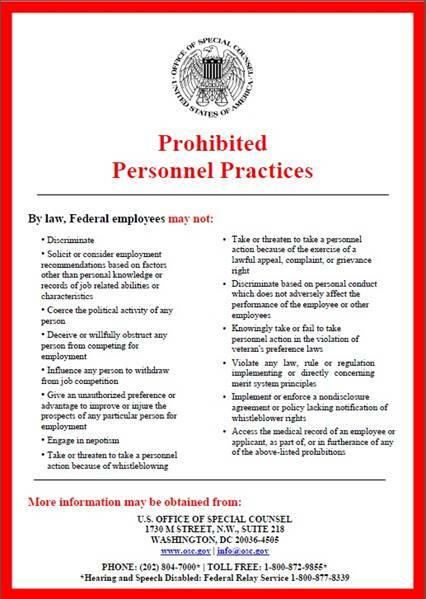 It is unlawful (i.e., a prohibited personnel practice) for agencies to take or threaten to take, or threaten to take, a personnel action against an employee or applicant because he or she disclosed wrongdoing or gross mismanagement (i.e., whistleblowing activities). Personnel actions can include a poor performance review, non-promotion, demotion, disciplinary action, unfavorable performance evaluation, and termination. How to File a Complaint of Whistleblower Retaliation? The Office of Special Counsel (OSC). OSC is an independent agency enforcing whistleblower protections, safeguarding the merit system, and providing a secure channel for whistleblower disclosures. Information on filing a complaint with OSC may be at www.osc.gov. TIGTA's Office of Investigations (OI) hotline at 1-800-366-4484 or at www.treasury.gov/tigta/contact_report.shtml. If you submit your complaint to TIGTA, OI will review the allegation to make a determination as to whether TIGTA OI will investigate the matter or refer the complaint to another appropriate agency. Allegations of reprisal regarding Equal Employment Opportunity (EEO) matters generally should be addressed through the EEO process. TIGTA's Whistleblower Protection Coordinator provides education to increase awareness of prohibitions against whistleblower retaliation and the rights and remedies against retaliation for making protected disclosures. The Coordinator is prohibited from acting as a complainant's legal representative, agent, or advocate. 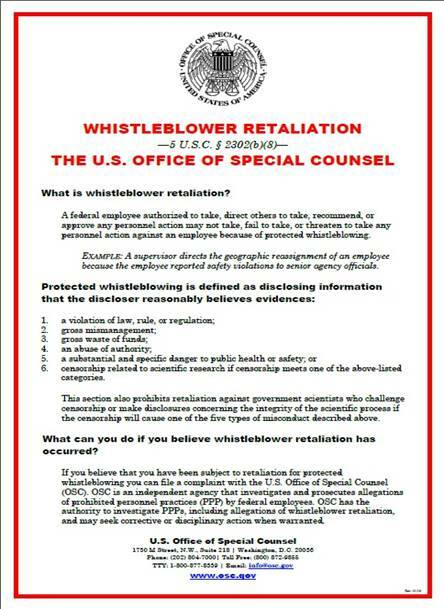 For additional information concerning whistleblower rights and remedies, please contact Lori Creswell at WhistleblowerProtection@tigta.treas.gov. A disclosure of waste, fraud, or abuse that includes classified information is not a protected disclosure under the whistleblower laws unless the disclosure is made in accordance with the laws and rules that govern the proper handling and transmission of classified information. For example, you are not protected for disclosing classified information to an unauthorized recipient, even if you reasonably believe the information is evidence of waste, fraud, or abuse. You can make a protected disclosure of classified information to the TIGTA, but the information may not be transmitted using the TIGTA’s unclassified hotline. For more information on how to properly provide classified information to the TIGTA, please contact the TIGTA’s hotline at 1-800-366-4484 or the TIGTA Whistleblower Protection Coordinator. Pursuant to Presidential Policy Directive (PPD-19), Protecting Whistleblowers with Access to Classified Information, an action affecting access to classified information cannot be taken in reprisal for protected whistleblowing. Employees of IRS Contractors, Subcontractors, Grantees, or Subgrantees of Personal Services Contractors. Under Title 41, United States Code, § 4712, it is illegal for an employee of a Federal contractor, subcontractor, grantee, or subgrantee or personal services contractor to be discharged, demoted, or otherwise discriminated against for making a protected whistleblower disclosure. These provisions are consistent with and do not supersede, conflict with, or otherwise alter the employee obligations, rights, or liabilities created by existing statute or Executive order relating to (1) classified information, (2) communications to Congress, (3) the reporting to an Inspector General of a violation of any law, rule or regulation, or mismanagement, a gross waste of funds, an abuse of authority, or a substantial and specific danger to public health or safety, or (4) any other whistleblower protection. The definitions, requirements, obligations, rights, sanctions, and liabilities created by controlling Executive orders and statutory provisions are incorporated into this agreement and are controlling.